This year marks one hundred years since the Irish Easter Rising of 1916, an armed insurrection against British rule in Ireland. Following the Rising, 3,430 men and 79 women were arrested, though many were subsequently released. Those remaining in custody were held in camps and prisons in England and Wales. 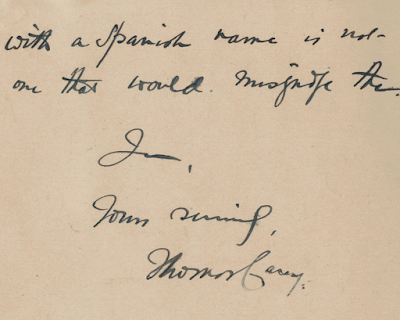 On 5 December 1916, Bishop Amigo received a letter from the Assistant Secretary to the Prison Commission, A.J. 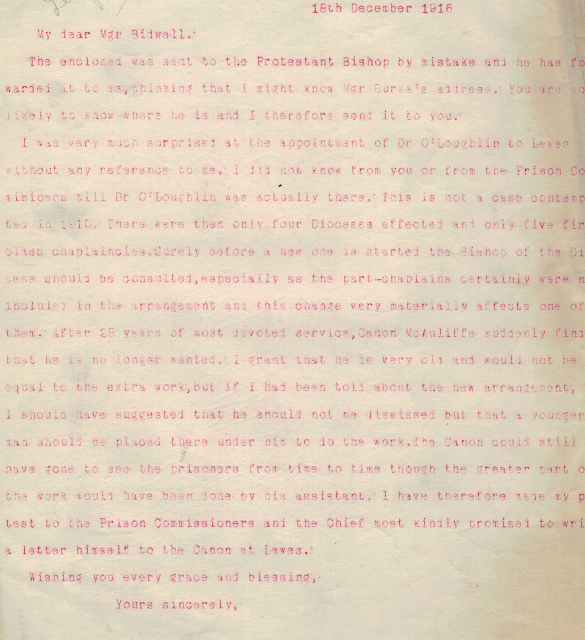 Wall, informing him that, “it has been decided to collect all the Irish prisoners sentenced to Penal Servitude and imprisonment in connection with the outbreak in Ireland at Lewes Prison, which will be set apart for them.” He went on to explain that the Commissioners had arranged to replace the part-time prison chaplain, Canon McAuliffe, with a full-time chaplain, Dr A.J. O’Loughlin from Portland Prison. Bishop Amigo was asked by Cardinal Bourne, Archbishop of Westminster, to give Dr O’Loughlin faculties as Lewes was within Southwark Diocese. I am directed by the Prison Commissioners to inform you that it has been decided to collect all the Irish prisoners sentenced to Penal Servitude and imprisonment in connection with the outbreak in Ireland at Lewes Prison, which will be set apart for them. As the duties required of the Roman Catholic Priest will be more than a part-time Officer could possibly carry out, the Commissioners have arranged for the transfer of one of their whole-time Priests, the Reverend A.J. O’Loughlin, DD, from Portland Prison. The Bishop of Plymouth has agreed to his transfer and it is understood that Cardinal Bourne will communicate with you on the subject. It is probable that this arrangement will only be a temporary one, and would terminate with the release or removal of the Irish Convicts. I believe the Prison Commission have written to you explaining the circumstances in which they propose to move Dr O’Loughlin, a whole-time prison chaplain, from Portland to Lewes, but as arranged at the Low week meeting, 1910, the Cardinal desires me to inform you of this change and to ask if you will kindly give Dr O’Loughlin faculties. Bishop Amigo, who had a difficult relationship with Cardinal Bourne, was not pleased that he had not been consulted on this appointment and felt that Canon McAuliffe had been badly treated. He called on the Home Office later that week to raise his displeasure. 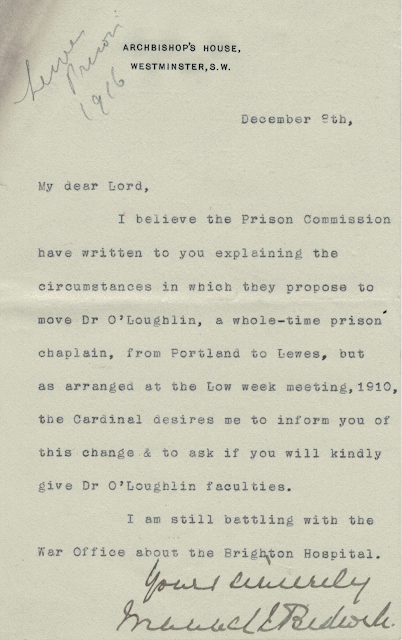 However, he also granted Dr O’Loughlin faculties and O’Loughlin went to Lewes prison. I fear that there has been some misunderstanding about appointing a chaplain to Lewes Prison without my being consulted first. 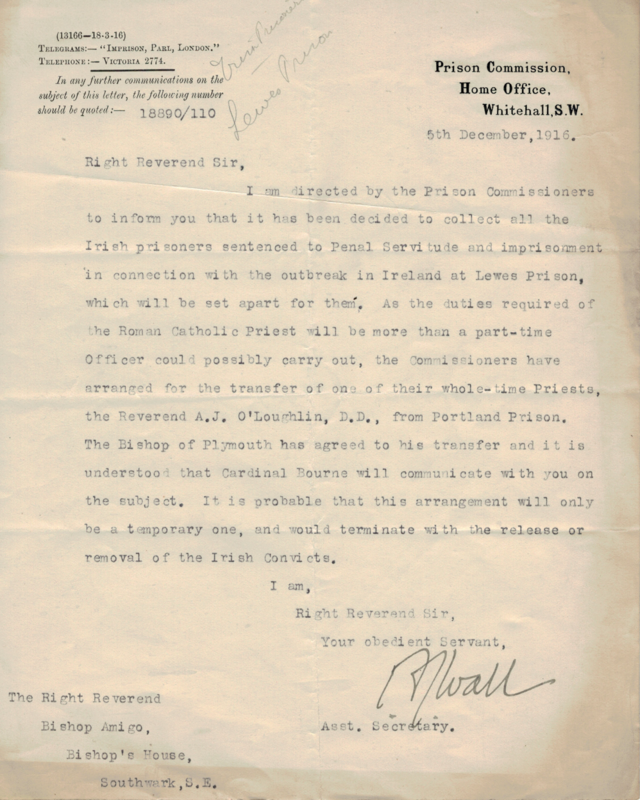 I am anxious to help the Prison Commission in every way, but priests have their own Superiors in the question of Mass and Confession and besides I do not like a devoted priest, Canon McAuliffe, to be even apparently treated badly after so many years at work with the Lewes prisoners. It is difficult for me to explain by letter and I propose doing myself the honour of calling at the Home Offices on Friday afternoon or Saturday morning. I was very much surprised at the appointment of Dr O’Loughlin to Lewes without any reference to me. I did not know from you or from the Prison Commissioners till Dr O’Loughlin was actually there. This is not a case contemplated in 1910. There were then only four Diocese affected and only five first class chaplaincies. Surely before a new one is started the Bishop of the Diocese should be consulted, especially as the part-chaplains certainly were not included in the arrangement and this change very materially affects one of them. After 28 years of most devoted service, Canon McAuliffe suddenly finds that he is no longer wanted. I grant that he is very old and would not be equal to the extra work, but if I had been told about the new arrangement I should have suggested that he should not be dismissed but that a younger man should be placed there under him to do the work. The Canon could still have gone to see the prisoners from time to time though the greater part of the work would have been done by his assistant. I have therefore made my protest to the Prison Commissioners and the Chief most kindly promised to write a letter himself to the Canon at Lewes." Éamon de Valera, a prominent and important figure in Irish politics in the twentieth century, was one of those imprisoned in Lewes Prison. Under his leadership, on 28 May 1917 the Irish prisoners began a strike demanding prisoner of war status. THE IRISH REBELS. TROUBLE AT LEWES GAOL. The Sinn Fein prisoners at Lewes Gaol recently went "on strike." After giving great deal of trouble they have been taken back to the convict prisons where their treatment, presumably, will be less considerate than at Lewes. In the House of Commons, on Monday the Home Secretary, in reply to Mr. Byrne, the Nationalist Member tor Dublin Harbour, said: The Irish prisoners were collected at Lewes and granted special privileges on the clear and definite condition of good conduct and obedience to rules. On May 28, on the professed ground that they wished to be treated as if they were prisoners of war, they were guilty of concerted refusal to work and disobedience to rules; and it became necessary to confine them to their cells. All the prisoners admitted the offences, which were committed openly. They were to be allowed to attend chapel on Sunday, June 3, but it was discovered that they proposed immediately after Mass and Holy Communion to refuse to enter their cells and, if forced to return, to wreck prison property. The service therefore was not held. When this attempt failed they refused to leave their cells for exercise unless all were taken out together. In these circumstances, no course was open to me but to direct that they should go back to the convict prisons (Maidstone, Parkhurst, and Portland), and be subject to the ordinary prison rules. Some of them have already been removed with such precautions only as were necessary to prevent any violence or attempt to escape. I need hardly say that the suggestion that they were starved is absolutely without foundation. INTENDED OUTBREAK AFTER MASS. 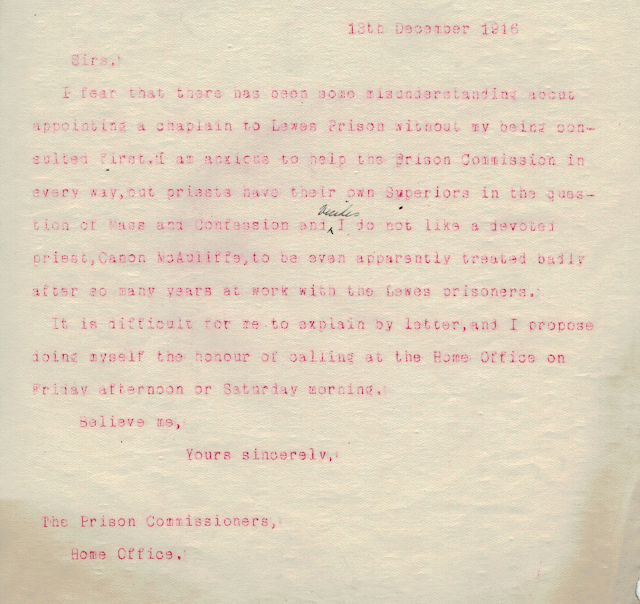 On Tuesday Mr. Ginnell asked whether the Home Secretary would specify any evidence that the Irish political prisoners at Lewes intended last Sunday week to commit any crime. Sir G. Cave replied: I stated the main facts yesterday. Evidence of the intended outbreak after Mass was obtained from a written communication which was being passed between the prisoners, and a large number of them, on being asked if they would undertake to proceed to and from chapel in a quiet and orderly manner, refused to give the promise. They were confined in their cells on account of their refusal to work and obey the rules, but they would in accordance with the usual practice have been allowed exercise daily had they not themselves persistently refused to leave their cells for that purpose. The use of a light chain during removal is a necessary precaution to prevent escape or violence on the part of convicts; there was no danger attempted rescue. The prisoners who are still mutinous are confined to well ventilated cells. There is no occasion for calling in any outside medical advice. 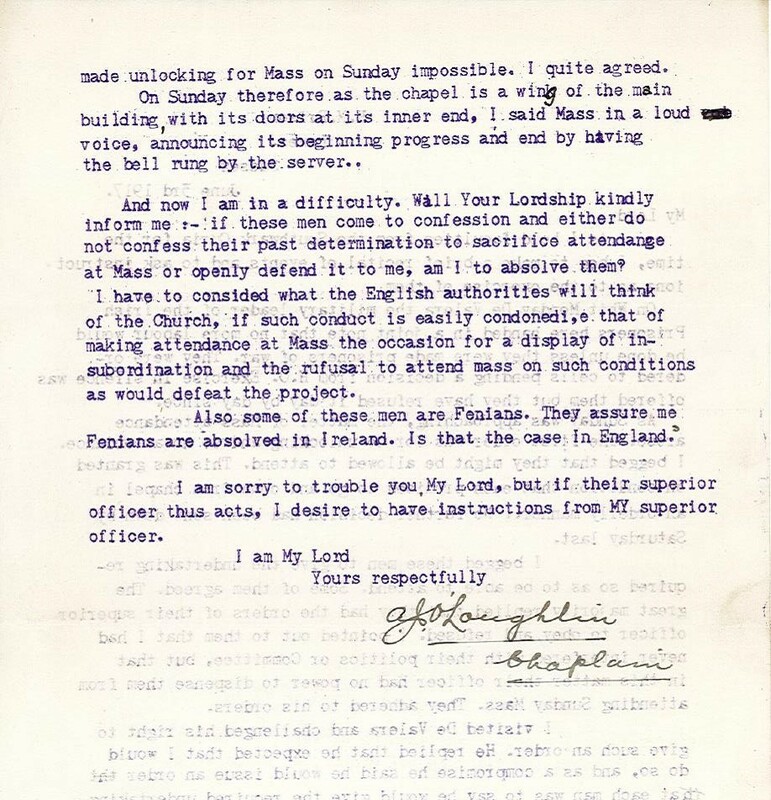 On 3 June 1917, the chaplain, Dr O’Loughlin, wrote to Bishop Amigo giving his account of the strike and asking for his advice on how he should deal with Mass attendance and confession in relation to the strike. As I hold faculties from the Southwark Curia for the time, I beg to make a brief recital of events and to ask instructions as to the exercise of them. 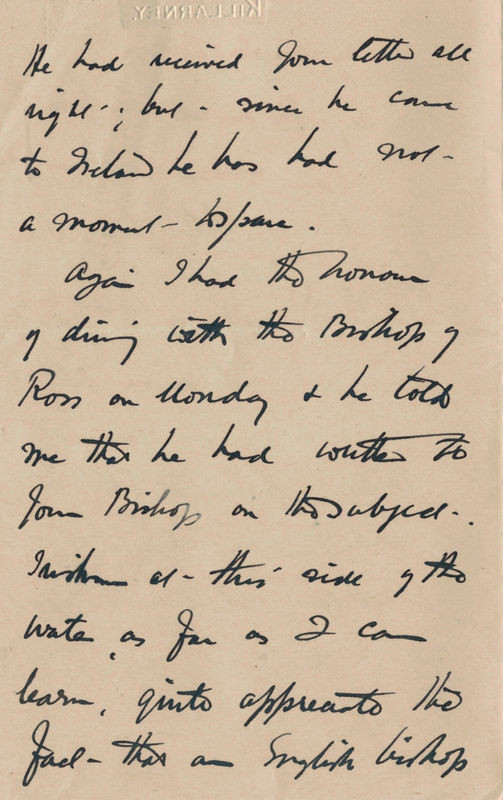 On Whit Monday De Valera, the military leader of the Irish Prisoners here, handed in a joint note that no more labour would be done unless they were made prisoners of war. They were ordered to cells pending a decision from H.O. Exercise in silence was offered them but they have refused it day by day since. As Sunday was approaching, the matter of Mass-attendance arose. The first order was for no unlocking and so no attendance. I begged that they might be allowed to attend. This was granted on condition that each promised to go and come from chapel in an orderly manner. No further decision had been sent down by Saturday last. I begged these men to give the understanding required so as to be able to attend. Some of them agreed. The great majority replied that they had the orders of their superior officer to obey, and refused. I pointed out to them that I had never interfered with their politics or Committee, but that in this matter their officer had no power to dispense them from attending Sunday Mass. They adhered to his orders. 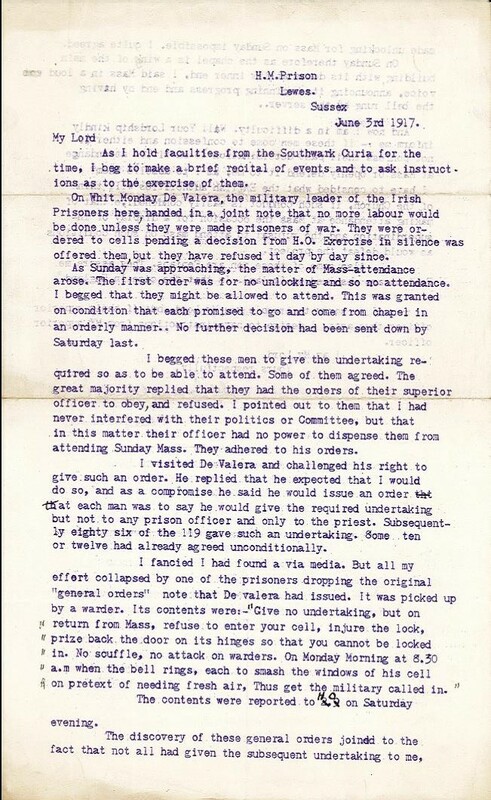 I visited De Valera and challenged his right to give such an order. He replied that he expected that I would do so, and as a compromise he said he would issue an order that each man was to say he would give the required undertaking but not to any person officer and only to the priest. Subsequently eighty six of the 119 gave such an undertaking. Some ten or twelve had already agreed unconditionally. The contents were reported to H.O. on Sunday evening. The discovery of these general orders joined to the fact that not all had given the subsequent undertaking to me, made unlocking for Mass on Sunday impossible. I quite agreed. On Sunday therefore as the chapel is in a wing of the main building, with its doors at its inner end, I said Mass in a loud voice, announcing its beginning progress and end by having the bell rung by the server. And now I am in difficulty. Will Your Lordship kindly inform me: if these men come to confession and either do not confess their past determination to sacrifice attendance at Mass or openly defend it to me, am I to absolve them? I have to consided [sic] what the English authorities will think of the Church, if such conduct is easily condoned i.e. 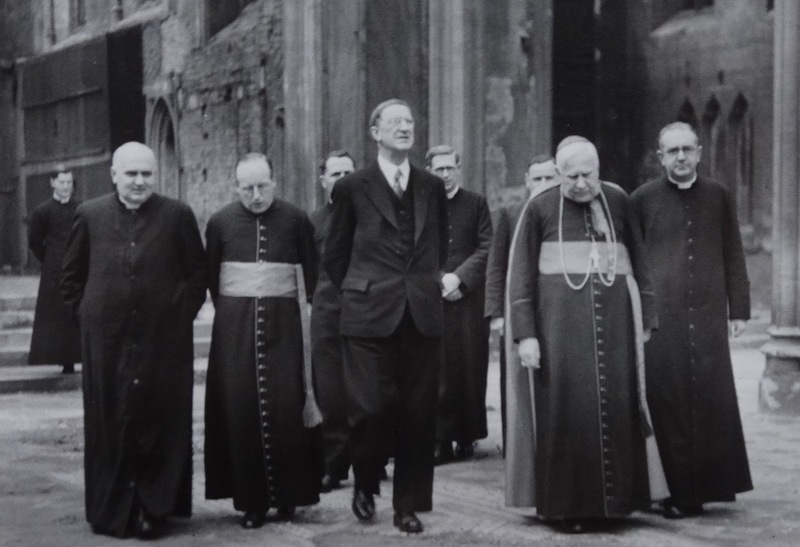 that of making attendance at Mass the occasion for a display of insubordination and the refusal to attend mass on such conditions as would defeat the project. Also some of these men are Fenians. They assure me Fenians are absolved in Ireland. Is that the case in England? I am sorry to trouble you, My Lord, but if their superior officer acts thus, I desire to have instructions from MY superior officer. I am very sorry that Irishmen under your care propose to use the occasion of being let out to Mass for the purposes of annoying the prison authorities, thus depriving themselves of the consolation which the Mass would give them. As to the absolution each case would have to be judged by you. It strikes me that they have shown no desire to miss Mass, but that they are determined to use any opportunity which presents itself to annoy the prison authorities. As a result of the strike, many of the prisoners were sent to other prisons around England. 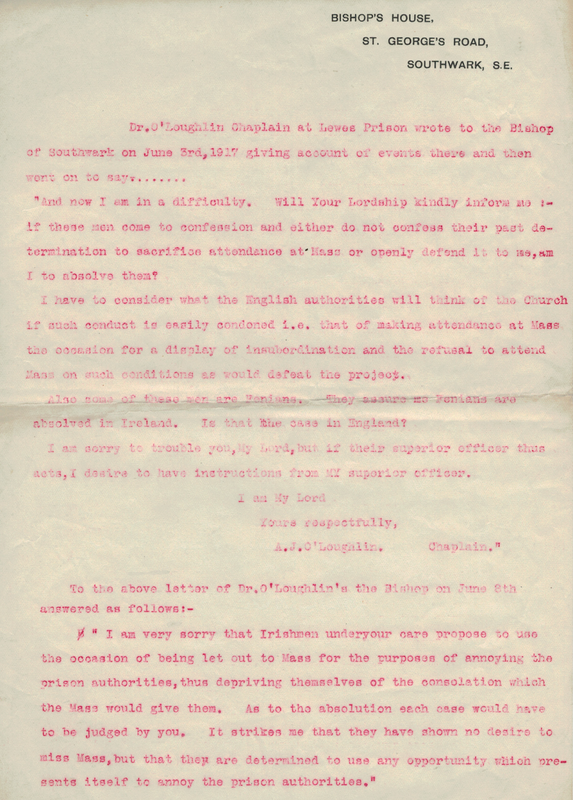 In June 1917 the British government declared an amnesty and all remaining Irish prisoners from the Rising in British prisons, including Éamon de Valera, were released. 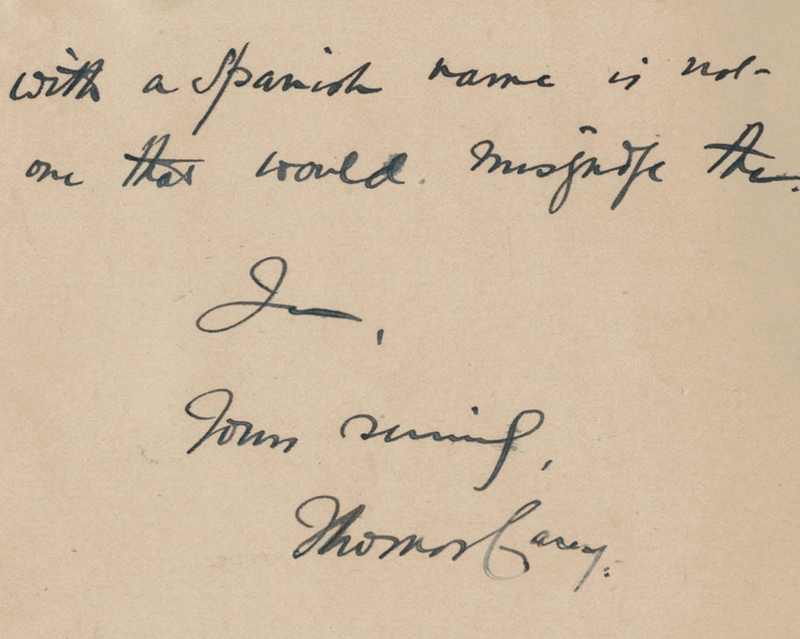 Bishop Amigo was a keen supporter of Ireland and in later years built up a good relationship with Éamon de Valera. 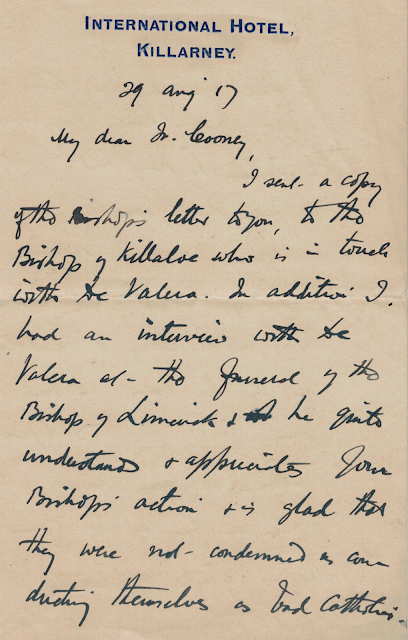 After de Valera’s release from prison in 1917 the Bishop wrote to de Valera and it would appear that de Valera was appreciative of the Bishop. I sent a copy of the Bishop’s letter to you, to the Bishop of Killaloe who is in touch with De Valera. In addition, I had an interview with De Valera at the funeral of the Bishop of Limerick and he quite understands and appreciates your Bishop’s action and is glad that they were not condemned as conducting themselves as bad Catholics. He had received your letter all right but since he came to Ireland he has had not a moment to spare. Again I had the honour of dining with the Bishop of Ross on Monday and he told me that he had written to your Bishop on the subject. Irishmen at this side of the water, as far as I can learn, quite appreciated the fact that an English Bishop with a Spanish name is not one that would misguide them.